With Valentine’s Day approaching, I’ve been thinking a lot about chocolate. Ok, I’m always thinking about chocolate, but the holiday is a good excuse to bake something sweet. 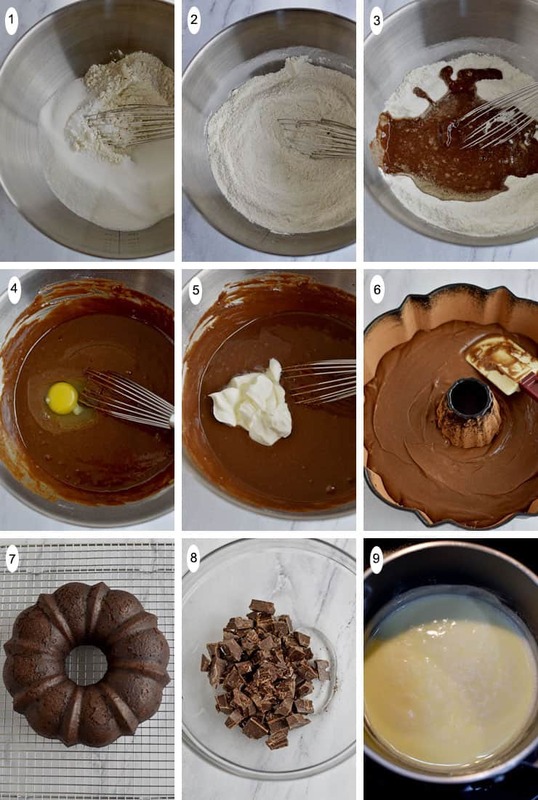 In my search for a new way to use chocolate, I found Bake or Break’s recipe for Chocolate Sour Cream Bundt Cake. I knew I had to try and modify the recipe to make it gluten free. 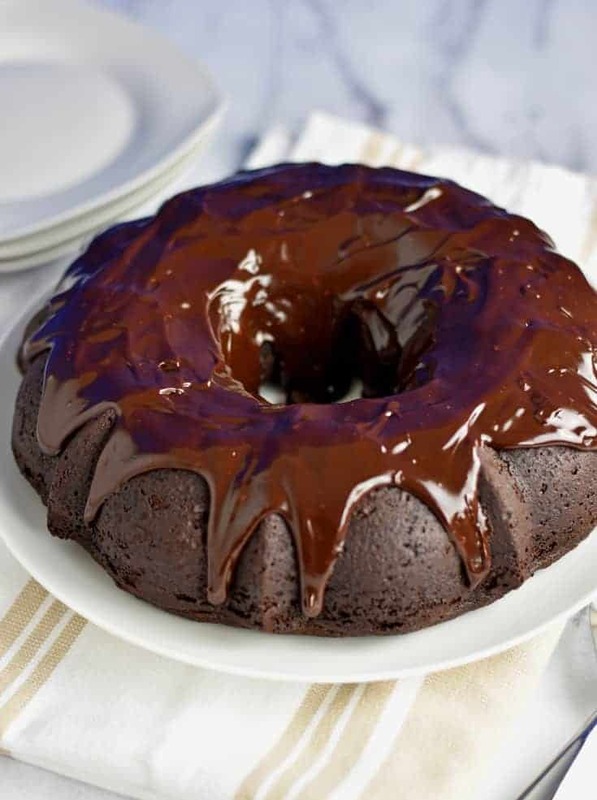 The chocolate glaze is more like a ganache. It’s smooth, creamy, wonderfully rich, and totally different than the light and delicate glaze on my Lemon Loaf Cake with Lemon Glaze. This cake is easy to make and full of chocolate goodness. 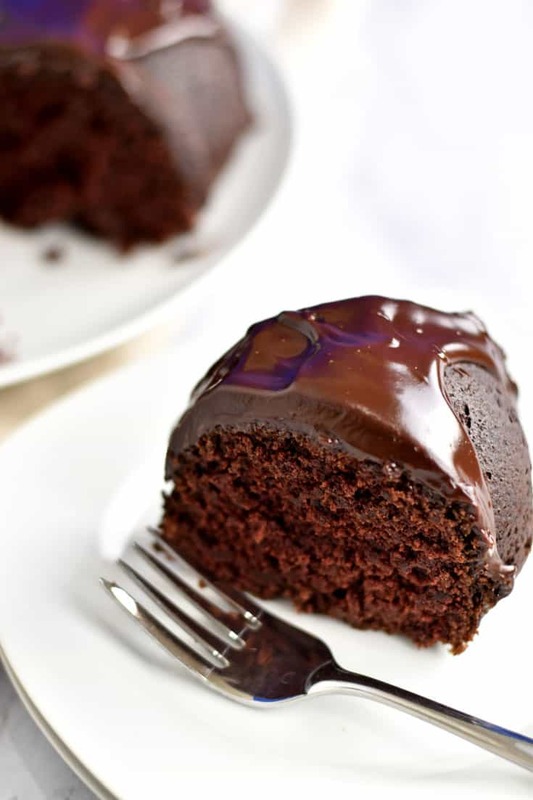 The sour cream in the recipe makes this a really moist chocolate Bundt cake. If you’re not a fan of chocolate, try my Gluten Free Banana Cake with Cream Cheese Frosting. Preheat oven to 350 degrees. Grease and flour a 10-cup or 12-cup Bundt pan. In a small saucepan, add the butter, water, cocoa powder, and salt. 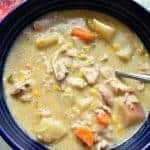 Cook over medium heat, stirring often, until the butter has melted and the mixture is completely combined. Remove from heat and set aside. In a large mixing bowl, add the flour, sugar, and baking soda. Whisk until combined (photos 1 & 2). Whisk in half the butter mixture until combined. Add the other half of the butter mixture and whisk until completely incorporated (photo 3). Then add the eggs, one at a time, whisking until combined (photo 4). Add the sour cream and almond extract and whisk until completely combined (photo 5). Pour the batter into the greased and floured Bundt pan and spread evenly (photo 6). Bake 40 to 45 minutes, or until a wooden pick inserted into the center of the cake comes out clean. Allow the cake to cool in the pan for 15 minutes. Then invert the cake onto a wire rack to cool completely (photo 7). Place the chocolate and corn syrup in a medium heat-proof bowl (photo 8). In a small saucepan, combine the heavy cream and sugar. Cook over medium heat, stirring occasionally, until the sugar has dissolved and the cream begins to simmer and bubble around the edges (photo 9). Pour the cream mixture over the chocolate and let stand for 5 minutes. Then whisk until smooth. Pour the glaze over the cooled cake. Allow the glaze to set for 5 minutes before serving. Generously grease and flour the Bundt pan. This will keep the edges of the cake from sticking to the pan. I use unsweetened cocoa powder instead of gluten free flour when preparing the Bundt pan. The flour can leave white flecks on the cake when you remove it from the pan. Any marks left by the cocoa powder blends with the color of the cake. Check the ingredients of your gluten free flour mix for xanthan gum. If your flour mix doesn’t contain it, try adding 1/2 teaspoon to the recipe. I used Bob’s Red Mill Gluten Free 1 to 1 Baking Flour which has xanthan gum in it. 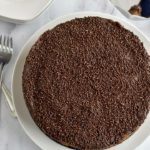 If you’re a chocolate fan, or have one in your life, you have to try this wonderful Gluten Free Chocolate Sour Cream Bundt Cake. 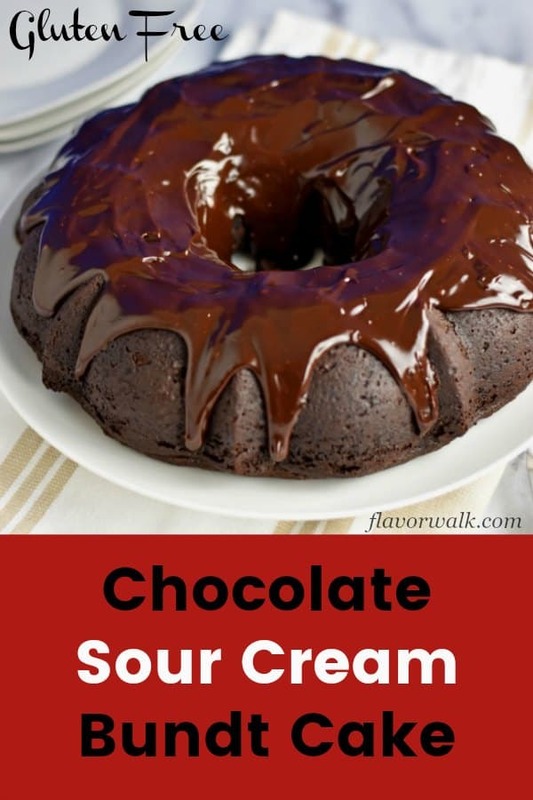 We think it’s the best sour cream chocolate cake ever! Happy Baking! MORE GLUTEN FREE CAKE RECIPES TO TRY! 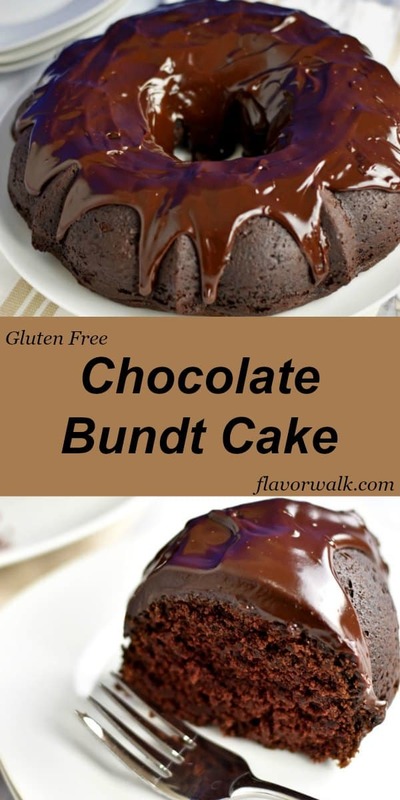 This Gluten Free Chocolate Sour Cream Bundt Cake, is rich, dense, and topped with a fudgy chocolate glaze. Easy to make and perfect for any occasion! Preheat oven to 350 degrees. Grease and flour a 10 or 12 cup Bundt pan. In a large mixing bowl, add the flour, sugar, and baking soda. Whisk until combined. Whisk in half the butter mixture until combined. Add the other half of the butter mixture and whisk until completely incorporated. Add the eggs, one at a time, whisking until combined. Add the sour cream and almond extract and whisk until completely combined. Pour the batter into the greased and floured Bundt pan and spread evenly. Bake 40 to 45 minutes, or until a wooden pick inserted into the center of the cake comes out clean. Allow the cake to cool in the pan for 15 minutes. Then invert the cake onto a wire rack to cool completely. Place the chocolate and corn syrup in a medium heat-proof bowl. In a small saucepan, combine the heavy cream and sugar. Cook over medium heat, stirring occasionally, until the sugar has dissolved and the cream begins to simmer and bubble around the edges. Pour the cream mixture over the chocolate and let stand for 5 minutes. Then whisk until smooth. Pour the glaze over the cooled cake. A little taste of bliss! This was easier to make than I thought and my family thought it was the best chocolate cake that I have made. Great cake to take to any function as it is easy to transport.